Achieve salon-worthy results with the BaByliss Salon Light 2100 AC Hair Dryer. Lightweight yet powerful, the hair dryer is powered by a long-life 2100 watt AC motor for ultra-fast, high performance drying, and utilises ceramic heat-balancing technology to promote sleek, frizz-free results. 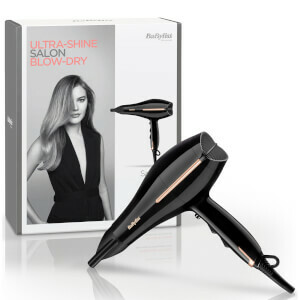 The variable speed and temperature settings enable customised styling, and its concentrator nozzle ensures maximum airflow for smooth, professional-looking styles; from bouncy volume to poker straight. Complete with a cold shot button for locking in style and shine.